I've forgotten where this info came from. Sorry! Edited by yours truly (contact me). The image came from Amazon.com. From the creators of Blue Submarine No. 6 , Last Exile is a Steampunk Sci-Fi adventure that takes place on the alternate world of Prestel, where beyond the creation of its Industrial Revolution where many ships sailed the skies, a long and bloody war between the countries of Anatole ("East") and Dysis ("West") raged. Casting a mysterious shadow on this conflict exists the organization known as the Guild. 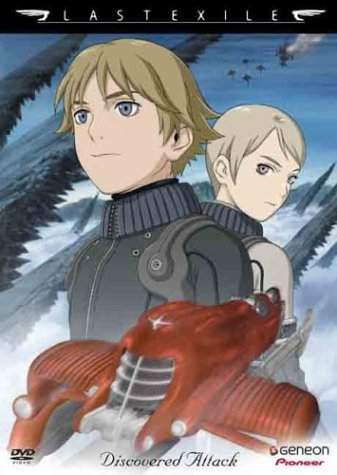 Last Exile is another anime that takes place in the future. I have noticed that it is very similar to Blue Submarine No. 6 except that it takes place in the sky. The two main characters Claus and Lavie, both 15 years old, accompanied by the mysterious Alvis Hamilton, an 11 year old girl who is completely unaware of what's going on, all find themeselves dragged into an awesome air ship known as the Silvana... which has a historical record of never being "sunk". Captained by Alex Row, they all eventually learn to live with the crew. The above description came from Aaron, and was edited by yours truly (contact me).